The past November 26th the people of the Argentinean province of Chubut, in Patagonia, were witnesses to yet another example of the limits of democracy when it comes to affecting the interests of transnational corporations. The past 26th November the people of the Argentinean province of Chubut, in Patagonia, were witnesses to yet another example of the limits of democracy when it comes to affecting the interests of transnational corporations. That province has been in the vanguard of the struggle against mega mining since 2003, when Esquel, located in one of the most beautiful spots of the Andes, became the first Argentinean city in passing a resolution rejecting new mining projects. A few years before, the Canadian transnational company Meridian Gold had located an area rich in gold at some ten kilometers from the city, which promised juicy profits. As is often the case, the project and negotiations with local and provincial authorities advanced in secret, until one of the communities of the mapuche people reported that the company was working in their ancestral land without their consent. After that denunciation, in October 2002 the neighbors of Esquel started to self-organize. Echoing the assemblies’ movement that had mushroomed in the country as part of the 2001 rebellion, a participatory, non-hierarchical Self-Organized Neighbors’ Assembly Against the Mine (Asamblea de Vecinos Autoconvocados por el No a la Mina) became their main organizational structure. Following a successful campaign and massive demonstrations, the city council agreed on calling a popular consultation. 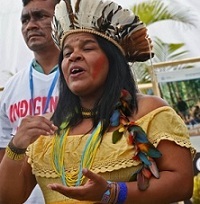 Against the politicians of the main political parties, who campaigned in favor of Meridian Gold, and despite several cases of intimidation of anti-mining campaigners, the result of the consultation, held in March 2003, was overwhelming. 81% of the citizens of Esquel decided they were just fine without a company destroying their mountains and poisoning their waters. Soon after that, other smaller cities in the area, including Trevelín, Lago Puelo and Epuyén, organized their own consultations and decided to ban mega mining. 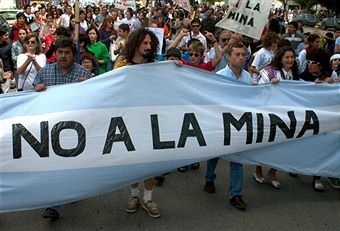 Anti-mining assemblies also sprang in cities on the Atlantic coast of the Patagonian provinces and in the northern Andean region and in other provinces, which came together in the Union of Citizens’ Assemblies (Unión de Asambleas Ciudadanas, UAC), a nationwide environmental and anti-mining coalition. As a result of these early struggles, in 2003 the province of Chubut passed a law banning some types of mega mining. Despite this, transnational corporations kept on exploring the land for new promising sources of benefits and investing tons of money in promoting their projects in the area, which somehow seem to always find enthusiastic governors. In this scenario, the June 2013 meeting of the UAC, which was held in Chubut’s biggest city on the Atlantic (Comodoro Rivadavia), decided to campaign for a province-wide popular consultation, banning all types of mega mining projects for good. The province’s constitution, amended twenty years ago, includes mechanisms of semi-direct democracy. If a citizen’s initiative manages to get the support of 3% of the voters, then the provincial congress is forced to discuss it (after which, of course, it can formally approve or dismiss it). Thus, the UAC set to the cities, towns and villages of the province to collect signatures for the new law. After a few months, having found massive popular support, they surpassed the 3% minimum and in last April they formally presented the law to the congress. It was the first time this constitutional right was used in the province. The bill was scheduled to be treated on 26th November. Of course, anti-mining campaigners were well aware that congressmen could vote against it. As a matter of fact, the provincial government –now in the hands of the peronist Martín Buzzi, an ally of Argentina’s president Cristina Kirchner– has his own majority in the congress and is very much pro-mining. As the debate was expected to be long and heated, anti-mining campaigners camped outside the congress. The severe police repression they faced was an indication that things were not going to go smoothly for them. What happened in the end was even worse than the worst scenario they had imagined. The provincial congress did not reject the proposed law. Instead, in a tight 15/12 vote, the congressmen of the majority used the opportunity to pass another law, totally different from the one proposed by the campaigners, that was not previously known or under consideration. Basically, the new bill suspends new mining projects for four months, during which the provincial government is mandated to facilitate a wide debate on an issue that –it was argued– still needs “serious” consideration (even if the province has been intensely discussing it since 2002). After the four months of debates are over, the new bill instructs the governor to call for a popular consultation on mining, and to take its result as mandatory. This would sound as good news for anti-mining campaigners, who had the idea to do that in the first place. But the tricky bill that was passed demanded that the popular consultation was not held in the province altogether, but dividing it by “zones”, so that if one zone wants to have mines it can have them, while regions that oppose, don’t. That was precisely the strategy of mining corporations for the province. Since some areas –like Esquel and other Andean towns– are (for the time being) considered lost, the best way to go about popular resistance is to try in others. The new bill not only enables that, but in fact also cancels the validity of the 2003 provincial law that had partially banned some types of mega mining. It is the perfect dream for companies. In fact, in the past years both the governor and the businessmen have been pushing together to promote silver, uranium and lead mining projects in the central plateau of the province, an area of scattered and impoverished little villages where transnational corporations have been running “corporate social responsibility” initiatives for a decade, hoping to win the hearts and minds of the inhabitants. It is not sure, but quite possible, that the combination of this kind of bribery and the forms of intimidation already used in the Andean towns may win pro-miners some local victories. And although it may sound “democratic” to let each community chose, in reality it is not. As campaigners have argued, the provincial courses of water run through the central plateau. Any contamination there will affect the whole province. If the corporations get away with it, it would mean that a village of 300 people will have the right to decide on the water that use 200.000. As if this political move was not scandalous enough, the peronist congressman Gustavo Muñiz, who voted against the popular initiative and for the new unexpected law, was caught in a rather infuriating photograph taken during the session. 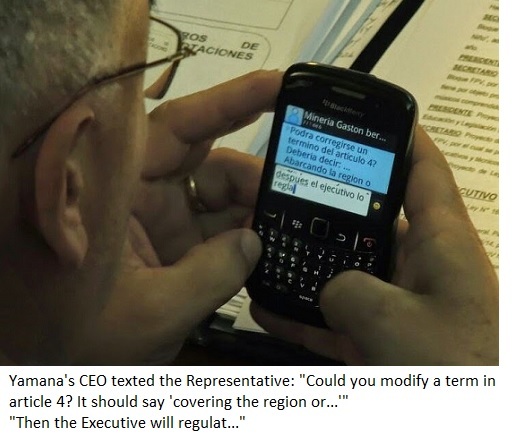 As the bill was under debate, the photo shows him chatting on his mobile phone with Gastón Berardi, local executive officer of the Canadian mining corporation Yamana Gold. The image is clear enough as to read what they were saying. While Berardi was indicating a needed change in the fourth article of the new bill so as to make “zoning” clearer, the congressman replied that he needed not worry as the governor would interpret it correctly upon implementation. The photograph went immediately viral throughout the country, forcing the main national newspapers –initially little inclined to report on this matter– to run stories about it. Muñiz had to publicly admit that he was taking “suggestions” from a company at the very moment a law was being debated in congress. (He seems to have been less keen on chatting with campaigners or normal folks.) No wonder that the spokespeople of the anti-mining movements denounced that, in Chubut, congressmen answer to foreign corporations and not to the people. Meanwhile, as the journalist Darío Aranda reported, the President of the Mining Chamber of Chubut, Néstor Alvarez, declared that he was happy with the new law, which, for him “opens up a new perspective” for the advance of mining in the province. As this story unfolds, it seems that the last word was still not heard. Anti-mining movements in the province are strong and determined and it would not be surprising that the scandal returns as a backlash against the winning party. 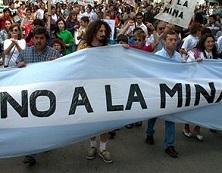 Several voices, including the Catholic Church and La Campora –the youth branch of the kirchneristas– have already demanded a government veto against the new law. Esquel, Rawson and other provincial cities have already organized massive demonstrations against politicians and their corrupt behavior. Campaigners already knew it, but Muñiz’s awkward photo made it blatantly clear for everyone else in the country. Corporations pose a serious threat not only to the environment, but also to democracy.